When I was growing up, in suburban St. Louis in the 1970s, my parents took us all skiing in Colorado at least one or two weeks every year. Typically, we would drive there in our Chevy van, which was royal blue, and had the innovative sliding door on one side, and had two rows of benches and a spacious back area. Whenever possible, I would chose the way-back, because it was here that a small child could sprawl out with her toys and play uninterrupted except for potty breaks for a 900 mile, 15 hour drive. It is a straight shot on I-70, right across the length of Kansas, and many years my father drove the whole way without stopping for more than gas or food. My father loved to drive. 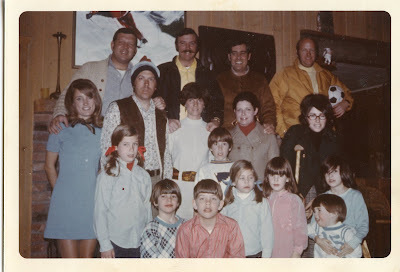 One winter, we were making our annual trip to Breckenridge, just on the heels of my younger brother recovering from the chickenpox. Chickenpox used to be a pretty common contagious virus, and predictably, one could expect an exposed child to come down with a case 10 to 21 days later. The new patient is pretty contagious for a couple of days before showing any symptoms, which are the itchy red spots all over the body. The older someone gets, the worse their case of chickenpox will be, it is said. It was not unusual in the days before the vaccine for parents to take a child with a brand new case and organize a play-date with children who had not yet caught it, essentially to expose the unexposed and get it over with. I was allowed to pack all of my new Christmas presents for this trip, which was one of the most memorable things about the trip. Other memorable things I recall are the game of strip poker the parents played (which involved taking a lap around the cabin outside in the snow), how my 16-year-old uncle contracted a whopping case of chickenpox, but missed barely a day of skiing by wearing a knitted face mask on the slopes, and how I never caught them. When my two older children were small, the chickenpox vaccine was a pretty new thing. Their pediatrician took the time to tell me about it before it was recommended for all children. I mentioned that while I remember being around other children with chickenpox as a child, I don’t remember ever having it. The pediatrician told me to get tested to see if I was immune, because if I wasn’t, I was the perfect person for the vaccine. As it turned out, I had no immunity to chickenpox, and was given a full course of the vaccine, which is two shots about 4 weeks apart. Months later, one of my boys contracted a case when I was just a few months pregnant. Since I had older children, I did not spend tons of time pouring over the requisite “How-To-Be-Pregnant” books that time around, but I had retained enough from my first pregnancy to remember that chickenpox was one of a long list of things you were not supposed to catch when you were pregnant. Later, I greeted the pediatrician for the hero that she was. She shrugged. A willingness to sit and have a conversation with me about family history, or sports, or calculus is, to me, a prerequisite for being a good doctor. Recently, my family practice doctor retired. He wrote prescriptions for things like “TLC,” and took the time to talk about stuff in general, and not just health. He always had a joke for me, and once told me the one about the sad mushroom who walked into a bar.